The time of year is here again. The persistent pings of my google calendar on my iPhone are constantly reminding me of a new hunting season opening. August 15th was archery antelope. September 1st was small game and archery elk and archery deer. Sometimes I feel like a kid with ADD hopped up on kool aid when I am trying to decide what to hunt each day. So, this past week I figured I would go for a “multi-sport” day. This meant I was carrying a bow as well as a .22 pistol. 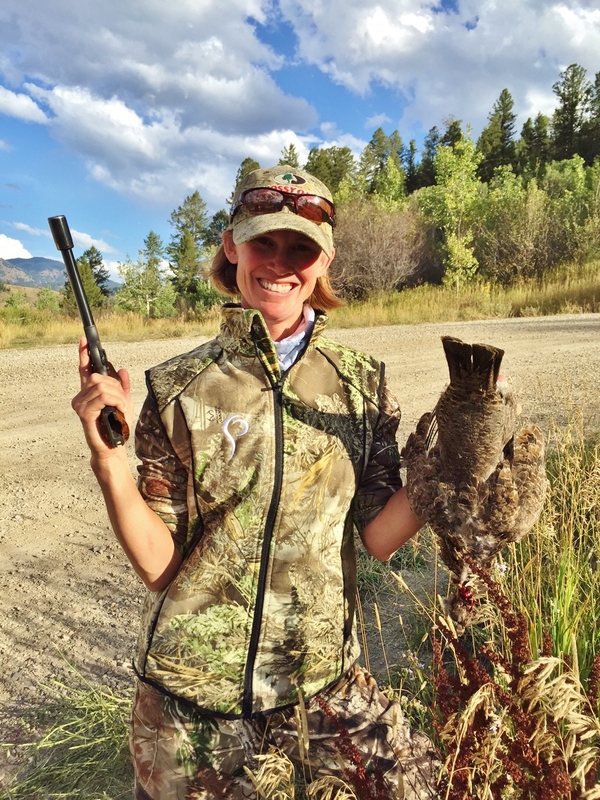 I hunt grouse with a .22 pistol for a few reasons; the first being that I did not have access to a shotgun and was not that great at shooting one anyways and the second being that I planned to hunt grouse while hunting big game and did not want to carry two long guns. Some folks might think that it is either unethical or illegal to hunt grouse with a pistol rather than a shotgun. Let me inform folks on a couple of things. As far as the legality, in Wyoming it is permitted to take Ruffed and Blue grouse with any type of weapon that sends a projectile. This might be a sling shot, a boomerang, a rock, a stick, a pistol, a bow, etc. As far as the ethics, in my humble opinion it is just as difficult to take a shot at a sitting grouse’s head with a .22 pistol as it is to shoot one with a shotgun on the wing. When one considers the pattern of the shot vs. the single .22 caliber bullet, it’s pretty obvious that shooting at a head the size of a fifty cent piece with a pistol is no “easy task”. Throw in the fact that often the birds have flushed into very tall conifer trees. It’s like a neck breaking game of “Where’s Waldo” to even find the bird and an even more interesting acrobatic feat to get into position to shoot one off that high branch with a pistol with open sights. That all being said, this year I had decided I would try to hunt grouse with a bow. I figured this would be pretty good practice for deer, antelope, and elk. Aim small…miss small, right? I had tried out a special arrow for shooting birds, the flu-flu arrow, that doesn’t travel quite as far but found that I would have to completely re-sight my bow to that arrow and I wasn’t willing to give up all the work I had done to sight in my bow for broad heads for big game. So, I opted to use my fast flying and long traveling arrow with a small game broad head to hunt the grouse with. With all of these fine plans in mind, I headed out to look for grouse and elk and deer in one day just south of my house in Jackson Hole, Wyoming. I carried my bow and my pistol and a heart full of childish optimism. I hiked for 3 plus hours and only saw a coyote. I never heard one elk bugle. I never saw one scrape or rub. I did cross a few cow and calf elk tracks but didn’t even catch a scent of them. The grouse that normally scare the bejeezus out of me when I am out hunting the woods were nowhere to be found. I finally called it quits and headed down the mountain as I had two kids that needed attending to after school. About a half mile from my vehicle I noticed a funny looking shape in the trail ahead of me. It didn’t look like a bird and I almost thought it more likely a rabbit. But, when I looked at it with my binoculars I realized it was a bird. It was a ruffed grouse in full strut. It was twice it’s normal size and parading around like a muscle bound Fabio at Venice beach. I quietly prepared my bow for a shot but in the meantime I realized that more birds, many more, had emerged onto the trail in between the male and myself. There must have been eight birds and they had no clue what I was as they began to walk slowly towards my feet. I could have limited out in less than two minutes had my pistol been handy. BUT, something about those birds stopped me. They were small and cute. They reminded me of something familiar and dear to me. They reminded me of my pet chicken, Gladys. I found myself watching them and thinking how cute their eyes were and how they were just about the same size as Gladys was. I thought, I can’t shoot them…they are too cute! Gladys is one of my newest chickens. She is the only surviving of three chicks in a coop with older hens; the other two having been killed by the brood already. Gladys has decided that I am her mother or protector or sister…whatever. When I go into the coop to supervise socialization with the older cannibalistic chickens, Gladys jumps up on my lap constantly and just sits and coos. If I put her down she flies up again. I believe she truly loves me but would probably peck my eyes out if she could; seeing as chickens will eat anything and are not very smart birds. But, I am a new chicken mama and I am kind of in love with Gladys. I had no idea that this might play a chord on my emotions while grouse hunting this year. As this flock of Gladys “look-alikes” amble towards my feet I decide to go after the strutting male as was originally planned. I walk slowly toward him and the juveniles decide that, even though they don’t know what I am, they better run and fly away from me. The next thing I know I am alone on the trail with only the sound of cheeps and chirps in the brush on either side of me. The male is gone, the juveniles are hidden, but alas…two have managed to fly into trees. One is to my left and the other to my right. I’ve got my bow in hand with an arrow nocked. I’ve got my pistol in the holster on my chest. In this quick moment Gladys is forgotten and my primal instinct has returned. I’m looking from bird to bird and trying to decide what to do. Shoot an arrow into the air, an unknown for me, or shoot my .22 at the grouse’s head? I finally decided to go with my original archery training plan. I drew back my bow, angling quite a bit backward to aim at the steep incline of the bird in the aspen tree. I set the pin low on her neck because I worried a body shot would ruin the meat. I let the arrow fly. The bird poofed up big, a few feathers let loose, she seemed to shake herself back into her senses, and then she jumped to a different tree branch unharmed except for the unexpected “hair” cut. At that moment I realized two things; I still had two birds in the bush and none in the hand, and now I had “lost” a $20 arrow and broad head into the thick aspen stand. I decided to try for the other grouse, still spectating from a branch to my left, with the .22 pistol. This was a new gun to me, a 1950 Colt Woodsman, that I am truly in love with but have not shot much. Obviously, I need to shoot it more because after shooting three times at the grouse’s head, she simply flitted to another branch and began feasting on leaves as if to say, “Whatever…”. So, here I am standing in the trail with two birds in the bush and still nothing to show for it except a lost arrow and a few shots fired out of my collector’s item pistol. I did the math in my head and decided that it would be too spendy an endeavor to shoot birds out of trees with arrows and I would just stick to my .22. With kids still needing their mom, I headed down the mountain again; one arrow lighter and one ego slightly deflated. Two days later I have the chance to get out for grouse again after a long day chasing antelope with my bow. I text my mother on my way back from the desert, “Are you up for some arrow retrieval and grouse hunting?” Of course she is. My mom is pretty much up for anything. I meet her at the base of the mountain and we head up the trail to the scene of my futile attempt at archery grouse. I show her the spot where I let the arrow fly and we attempt to guess the trajectory. We mentally set out a grid, we circle, we circle back, we check the trajectory again, we chase a few more of those same silly juvenile grouse but to no avail. We tangle ourselves in the death clutch of willows and dead fall. We search for a good hour and a half for that lost arrow with fluorescent orange fletchings that seemingly would not be so hard to find. Finally, we resign ourselves to giving up the search for today as the time was near to attend to kids again. So, we head down the mountain; empty handed….again. I am driving down the windy gravel access road when I see a very large grouse cruising the ditch on the side of the road. I bring the car to a stop. I grab the pistol that I had luckily kept handy for just this sort of situation. I tell my mom to sit tight as I get out of the car and crouch into a position to take a shot at the grouse. I am really hoping my hand is steady and my aim is true. That is a BIG grouse! I check my grip, I check my sight alignment, I gently press the trigger and; BAM! the grouse is flopped over dead (I think). Except when I walk over to it to “check it’s vitals”, it begins to flap its wings vigorously even though it’s head is nearly detached from the body. I realize that the bird truly is dead but the muscles are still firing and the wings are still flapping. I can’t put it in the car like that! Finally, after a bit more stubbing, it goes still. I throw it into a bag and into the vehicle and we are on our way down with the biggest grouse I have ever shot. After two days of hunting, and the most unique grouse hunting experience ever, it might have made up for my lost arrow. Lost, that is, for now.